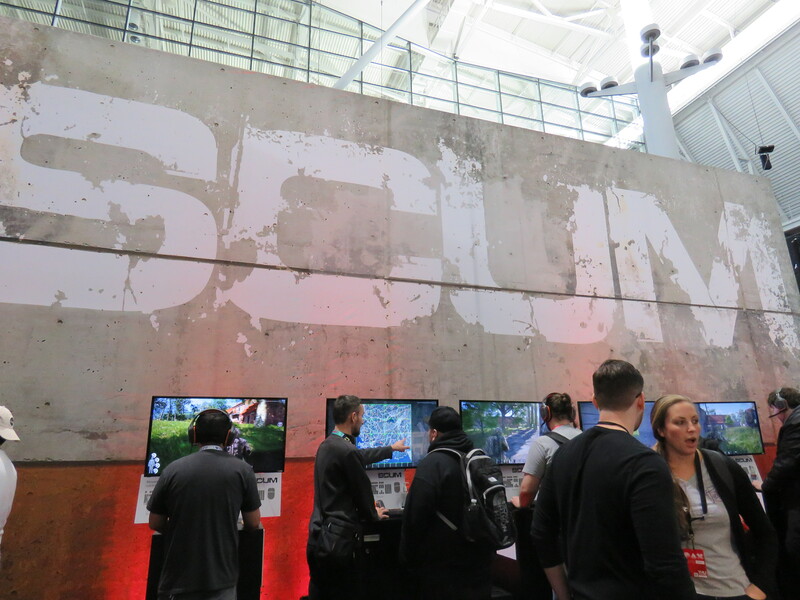 Finally being able to check out SCUM was my main goal for PAX East 2018. I went in with an open mind because I’m not one for sim-based games, but I do love shooters! After looking through the menu and playing around, it did seem overwhelming at first. There are a lot of bars and meters you need to take into consideration while playing from hydration to vitamin deficiency, but it is a survival game at the end of the day. Once you get the hang of all of those stats and what they mean, it becomes clear what your priorities should be and how to manage them by using the crafting system or even finding goods around the map. SCUM’s multiplayer was described to me that it’s in the style of Grand Theft Auto 5. While you’re in the main game you’ll be on a survival island which houses all 64 players. During this time you’ll be given the opportunity to partake in events which occur in different locations of the map. These events vary but the event showcased at PAX East was a 5v5 attack/defend style match. Both teams have to go to select points to find a key, once the proper key is found, find the supply crate and open it. Once open your team has to defend it by keeping the key away from the other team. If they get they key, it’s their turn to defend and your job to attack. The winner of the event gets rewarded with goods to carry over to the survival side of the game. The loot varies from armor to weapons, or even weapon attachments. Alongside those rewards, you’ll also be given money and fame. Everyone in SCUM is a prisoner and part of a television show. Earned fame can be used to call in favors, like keeping some of your loot if you die in the survival side of the game. Staying alive can be tricky, but there are many skills and attributes that can help. Your character can gain or lose weight, get stronger or weaker, or even become better trained in firearms. Since SCUM is a full-blown sim-shooter, there are a ton of ways to customize a character. Even weather can have an effect on your character. Wet clothes will need to be dried and carrying a lot of weight will quickly drain stamina. SCUM is being by Gamepires and available on Steam Early Access Q2 2018.